The Detect Rise Positive block detects a rising edge by determining if the input is strictly positive, and its previous value was nonpositive. The output is true (equal to 1) when the input signal is greater than zero, and the previous value was less than or equal to zero. The output is false (equal to 0) when the input is negative or zero, or if the input is positive, the previous value was also positive. Output signal that detects a rising edge whenever the input is strictly positive, and its previous value was nonpositive. The output can be a scalar, vector, or matrix. Set the initial condition of the Boolean expression U/z > 0. 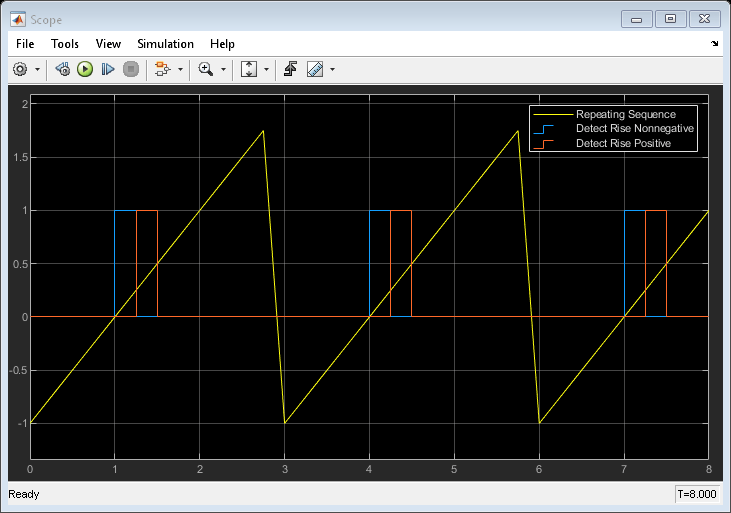 Detect the rising edge of a signal using the Detect Rise Nonnegative and Detect Rise Positive blocks.